This paper presents a knowledge management experiment realized in an industrial company. Our research concerns the development of a knowledge engineering module integrated in a collaborative eGroupware system. This platform is used by engineers to realise their projects in a collaborative way and in following a defined professional process. The first step of our approach is based on the modelling of the professional process used by professional actor. We have developed a formalism called RIOCK (Role Interaction Organisation Competence and Knowledge) to identify the emanating Knowledge resulting from the interaction between the roles played by professional actors. According to the obtained cartography of Knowledge, we have defined a typology of Knowledge and built an ontology to create a representation language in order to share and broadcast Knowledge. In other hand, the RIOCK models allow us to design a knowledge engineering module based on a multi-agents system. 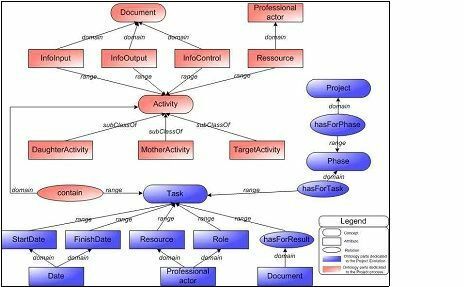 This system monitors the action of the professional actors inside the eGroupware and capitalizes, annotates, and broadcasts Knowledge in using the semantic web technologies and the ontology. Un article en anglais de Davy Monticolo, Vincent Hilaire , Samuel Gomes , Abder Koukam. Keywords: Knowledge Engineering, Multi-Agents System, Ontology. In recent years, manufacturing companies have to innovate in order to improve competitiveness and business performance. They must bring innovative products to market more effectively and more quickly to maximize customer interest and sales. Thus project teams of engineering departments have to leverage and reuse the product-related intellectual capital. The design process has to be rationalized in managing knowledge, know-how and technological patrimony. Moreover the information technology explosion of the last decade, allows to companies to manage efficiently masses of information, with powerful search capabilities i.e. catalogues and on-line information systems. However engineers have at their disposal too much information and prefer to use their experience rather than these information systems. This article describes works carried out in collaboration with project teams of the Zurfluh- Feller company specialized in the mechanisms of rolling shutters. Our investigation is about using several emerging technologies to support a Knowledge Engineering approach. This one produces methods, techniques and platforms to collect, analyze, structure and represent Knowledge. This Knowledge arises from collaborative professional activities testifies to a relative truth (Matta et al. 2000). This knowledge is based on experiences of human resources, and project experiences in terms of project management issues, design technical issues and lessons learned. The coherent integration of this dispersed know-how in a corporation, aimed at enhancing its access and reuse, is called “corporate memory” or “organizational memory”. It is regarded as the central prerequisite for IT support of Knowledge Management and is the means for knowledge conservation, distribution, and reuse. We work on the build of a project memory model we have called ‘MemoDesign’. A project memory is simply organizational memory for a project team; it has a more limited scope than organizational memory since it is composed by the knowledge emanating only during engineering projects. Our approach aims to analyze and model the professional process used by project team in order to identify emanating Knowledge. In collaboration with project teams, we have defined the types of knowledge to capitalize and which represent the structure of our project memory. Then we have explained and described each concept and relation of the project memory to build the associated ontology (Called OntoDesign). To manage this project memory, we have developed agents to constitute a multi-agent system (MAS) i.e. a loosely coupled network of agents that work together as a society. A MAS is heterogeneous when it includes agents of at least two types. We have defined several types of agent to support each part of the knowledge management process in order to assist engineers to exploit Knowledge all along projects. The first part of this paper presents the related works in agents systems in knowledge engineering. The second part presents our building process of a project memory with its associated ontology. The last section describes the multi-agents system dedicated to the management of project memories. Agents support and extend human interactions and capabilities, organize knowledge by facilitating information and documents retrieving and cataloguing. A new and very interesting research field recently growing is Agent-Mediated Knowledge Management (AMKM) whose intent is to link the Knowledge Engineering theories with the Agent-based models. Dignum (Dignum et al.2005),Van Elst and Abecker (Abecker et al. 2003) argued that “the basic features of agents (social ability, autonomy and proactiveness) can alleviate several of the drawbacks of the centralized technological approaches for KM”. They proposed three dimensions to describe agent KM systems: the system development layer (from analysis to implementation of the system), the macro-level structure of the system (single agent and Multi-agents models) and the KM applications area (share, learn, use, distribution and so on). Taking into account the second dimension, they proposed a classification of software or experimental models of agent systems that could support Knowledge Engineering. For example, agents whose task is to support knowledge workers in their daily work in a way to become “a personal assistant who is collaborating with the user in the same work environment” (Maes 1994). Many different examples fall into this category, like Lieberman’s Letizia (Lieberman 1995), the OntoBroker developed by Staab and Schnurr (Staab and Schnurr 1995) and the AACC project in (Enembreck and Barthès 2002). Agent-based systems have also been developed to support the creation of Organizational Memories, “meta-information systems with tight integration into enterprise business processes, which relies on appropriate formal models and ontologies as a basis for common understanding and automatic processing capabilities” (Abecker et al. 2003). An example can be found in the FRODO project, a Distributed Organizational Memory System in which agents communicate with the FIPA ACL language. In this work, agents are not only described by their knowledge, goals and competencies, but also by their rights and obligations. In the same aim, Gandon (Gandon et al. 2002) develops a MAS using semantic web technologies to manage organizational memories. Our cartography of knowledge is inspired by the step presented by (Suyeon and Hyunseok 2003) with four steps; to identify knowledge inside professional processes, to define knowledge necessary to capitalize, to describe the typology and taxonomy of knowledge and to specify the attributes and relations of the knowledge concepts. Our cartography of knowledge is based on its identification from an organisational approach to model the professional processes implemented in projects. Our modelling is built with the concepts of Roles, Interactions, Organization Competence and Knowledge (Hilaire and al. 2000), (Monticolo et al. 2007). An organization models the professional process containing several under organizations modelling themselves the phases and activities of the process. Inside, roles are generic behaviours. These behaviours can interact mutually according to interaction pattern. Such a pattern which groups generic behaviours and theirs interactions constitutes an organization. 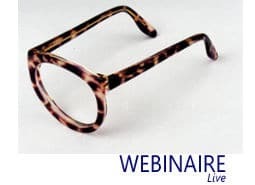 Indeed professional actors instantiate an organization (roles and interactions) when they exhibit behaviours defined by the organization’s roles and when they interact following the organization interactions (Castelfranchi 2004). Inside the professional process, the actors use and share their knowledge to carry out in a collaborative way the activities of engineering and thus develop their learning resulting from the knowledge capitalization process. From the experiments and observations carried out in the company, we defined, for each organization (activity of the professional process) several roles interpreted by professional actors. We allocate to these roles the competences which they use to achieve the activities. The competence is the capacity for an individual to implement its knowledge and to develop its know-how. Competences are also developed during the achievement of professional activities, in which the share of knowledge takes place. Each competence is aggregated with a set of knowledge. In the activity (i.e. organization) ‘to write the schedule of conditions’ we observe three roles (Figure 2). The role ‘Technical commercial assistant’ uses one of its competences, we read it like the capability to ‘To formalize the requirement of the customer’. This competence requires three elements of Knowledge which are used to satisfy the organization. 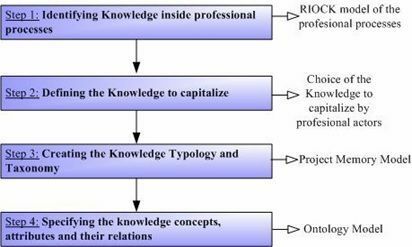 In the RIOCK diagram the type of knowledge are read like Knowledge on, for example the role project leader possesses the Knowledge on ‘means of industrialization of the company’. In addition RIOCK presents the result of the collaboration among these three roles; here this is the schedule of condition. The modelling of the professional process with RIOCK allows us to obtain a precise identification of knowledge used, shared and created. With this modelling we have wrote a series of knowledge which we have submitted to the professional actors. Afterwards they have validated knowledge to capitalize in the project memory. We can draw up a list of knowledge identified like necessary to capitalize. In order to present a Knowledge classification we have realised a regrouping of Knowledge. On the whole Knowledge identified like necessary to capitalize, we have six groups of Knowledge (table 1). Each group represents a type of Knowledge. In order to structure the Knowledge, we have created a taxonomy. This is a classification of information entities in the form of a hierarchy, according to the presumed relationships of the real-world entities that they represent. Furthermore the classification is based on the similarities of the information entities called concepts. 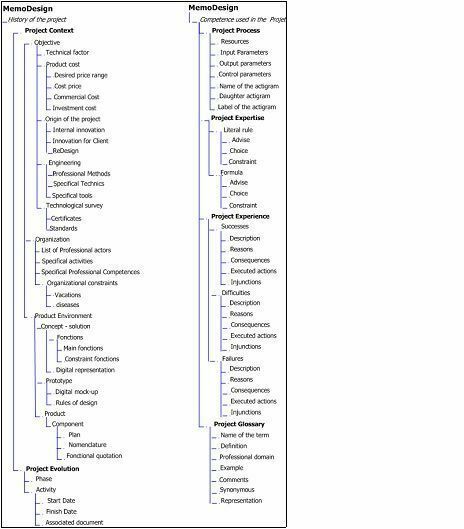 This taxonomy represents the structure of the project memory MemoDesign. The first part of this step is to define the relations between the concepts of the taxonomy. We give a unique name of potential relations the concepts they link in specifying domain and range. The second part of this step is to associate a set of attributes for each concept. The figure 6 presents a graphical view of the ontology OntoDesign with the relations, attributes and concepts associated of the project evolution and the project process. We specify the project memory concepts and their relationships in the ontology OntoDesign and formalize this ontology in OWL using the W3C recommendations. OntoDesign provides an integrated conceptual model for sharing information related to a mechanical design project. An OWL property (figure 7) is a binary relation to relate an OWL Class (Concept in OntoDesign) to another one, or to RDF literals and XML Schema datatypes. For example, the “infoInput” property relates the Document class to the Activity class. 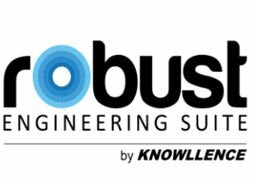 Described by these formal, explicit and rich semantics, the domain concept of Activity, its properties and relationships with other concepts can be queried, reasoned or mapped to support the Knowledge sharing across the mechanical design projects. We propose to introduce a multi agents based model to provide the cognitive and social approach in modelling the intelligent collective and individual behaviours which composed the mechanical design process. With the RIOCK formalism (section 3) we have observed that professional actors play different roles in different organizations (activities) and for each of them they develop competences in using knowledge. With regard to these concepts, we propose a Multi Agents model called KATRAS (Knowledge Acquisition Traceability Re-used Agents System) which the aim is to capitalize from the roles of the professional actors all along projects. – The first level ensures the traceability of users activities inside an e-groupware plate- form. In this level we find the type of agents called `Professional Agents’. These agents exist for one project. They monitor roles of the professional actors through-out projects in building their own RIOCK organization to identify emanating Knowledge. 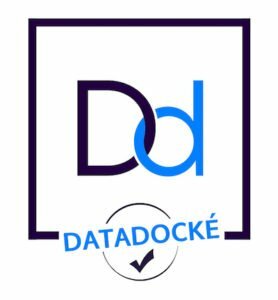 Their objective is to ensure a traceability of the collaborative actions carried out by professional actors in order to capture and annotate knowledge. They consult the ontology OntoDesign to use a common vocabulary in their annotations. – The second level gathers mechanisms of Knowledge capitalization. In this level we find the type of agents call `Project Knowledge Managers Agents’ (i.e. ProjKMA). The aim of ProjKMA is to capitalize from knowledge annotations of engineering activities communicated by the PA agents. The organization of this Knowledge is done according to the ontology model OntoDesign presented in section. Communities of ProjKMA exist for each project. Therefore the ProjKMA build the project memory of the project in which they are created. They also propose solution to professional actors all along the current project. – The third level contains the agents type ‘Professional Knowledge Managers Agents’ (ProfKMA). These agents exist for every projects, their aim is to synthesize the Knowledge structured according to project memories for the whole of projects. The Knowledge capitalized and reused during one project is a Project Knowledge, and the Knowledge capitalized during the whole of the projects and reused in a new project is a Professional Knowledge. Therefore ProfKMA are able to propose solution from professional Knowledge all along a new project. 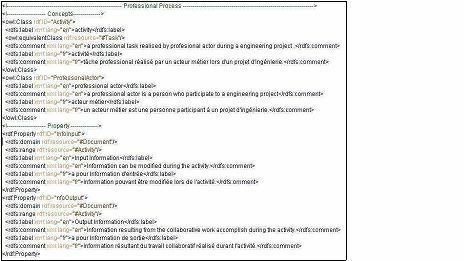 – Project Management with the history (Lateness reasons and effects) of the professional activities and the proposition of a project model. – Product management with the contribution of professional rules used during the development of similar product. – Process management where agents propose optimized professional process from the sequences of encountered activities. As these application deployments progress, we believe we can reduce the design time of routine products. In other hand, the contribution of our agents to develop novelties product intervenes at the time of the solutions research and avoid redeveloping existent products. Abecker A., Bernardi A., and Van Elst L. (2003); Agent technology for distributed organizational memories. In Proceedings of the 5th International Conference On Enterprise Information Systems, Vol. 2, pages 3–10. Enembreck F., Barthès J.P. (2002); Personal assistant to improve CSCW. In Proceeding of CSCWD, Rio de Janeiro, 2002. Hilaire V., Koukam A., Gruer P. & Müller J-P (2000); Formal Specifi-cation and Prototyping of Multi-Agent Systems. Engineering Socie-ties in the Agents’ World, in Lecture Notes in Artificial Intelligence. n°1972, Springer Verlag. Lieberman H. (1995);. Letizia: An agent that assists web browsing. In Chris S. Mellish, editor, Proceedings of the Fourteenth International Joint Conference on Artificial Intelligence (IJCAI-95), Montreal, Quebec, Canada, August 1995. Staab S. and Schnurr H.-P. (2000); Smart task support through proactive access to organizational memory. Knowledge–based Systems, 13(5):251–260.